Swap your garden weeds for free native plants on Saturday 6 August at Redlands IndigiScapes Centre during Trees for Weeds Day. 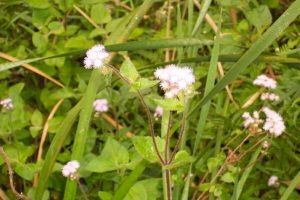 Redland City Mayor Karen Williams said Council was offering up to five local native plants per person in an effort to rid the Redlands of unruly, invasive weeds that threaten native wildlife and habitats. “Weeding at this time of year is a great opportunity to prepare your garden before the warmer months and Council are offering local native plants in exchange for bags of weeds,” Cr Williams said. “Some of the most common garden plants of our region are actually invasive and prolific weeds when they escape into surrounding bushland, where they cause damage by outcompeting native habitat. “By removing weeds and replacing them with easy-to-keep native plants, you’re doing our natural environment a favour – and Council will give residents a free native plant in exchange for a plastic shopping bag of weeds during Trees for Weeds. “All weeds are welcome however this year’s main focus will be on Blue Billy Goat, Singapore Daisy Fishbone Fern and Cocos Palm. Blue Billy Goat: herbaceous groundcover with distinct clusters of small blue-purple flowers most of the year. It has serrated leaves that are covered in short hairs. 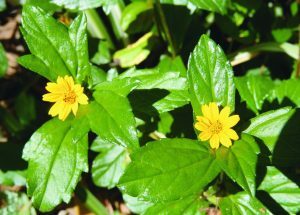 Singapore Daisy: glossy leaves and bright yellow flowers that forms dense mats of ground runners that smother native plants. 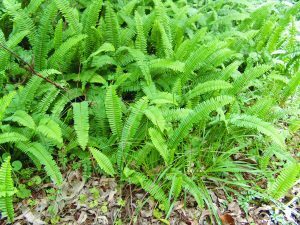 Fishbone Fern: Wiry, scaly stems that branch and spread over the ground. Can grow densely and expand rapidly to dominate ground surface. Fronds erect or arching to 75cm long. NOTE: where fishbone fern appears to be growing naturally in undisturbed bushland and is not apparently a garden escapee it should not be removed. 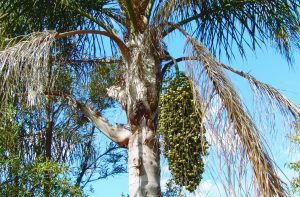 Cocos Palm: Fast-growing tree to 21m with a sturdy, ridged trunk and green leaves that grow to 4.5m in length with long, strappy leaflets radiating from the central leaf stem. Flowers are small and inconspicuous and the fruit are a fleshy orange berry up to 2.5cm long. Trees for Weeds Day will take place at the IndigiScapes Nursery on Runnymede Road, Capalaba, from 9am-2pm on Saturday 6 August. Events on Straddie and Bay Islands will take place on Saturday 20 August in six island locations: North Stradbroke, Karragarra, Coochiemudlo, Macleay, Russell and Lamb islands. Council is urging island residents to target Fishbone Fern and Mother of Millions this year. For more information, contact 3824 8611 or visit IndigiScapes. Posted in Community, Environment, Events, Uncategorized and tagged .